Megan McArdle’s excellent op–ed in The Washington Post, ‘A farewell to free journalism’, has been bookmarked on my phone for months. It’s a very good summary of where things are for digital media, and how the advent of Google and Facebook along with the democratization of the internet have reduced online advertising income to a pittance. There’s native advertising, of course, which Lucire and Lucire Men indulged in for a few years in the 2010s, and I remain a fan of it in terms of what it paid, but McArdle’s piece is a stark reminder of the real world: there ain’t enough of it to keep every newsroom funded. I’ll also say that I have been very tempted over the last year or two to start locking away some of Lucire’s 21 years of content behind a paywall, but part of me has a romantic notion (and you can see it in McArdle’s own writing) that information deserves to be free. Everyone should get a slice of the pie if they are putting up free content along with slots for Doubleclick ads, for instance, and those advertising networks operate on merit: get enough qualified visitors (and they do know who they are, since very few people opt out; in Facebook’s case opting out actually does nothing and they continue to track your preferences) and they’ll feed the ads through accordingly, whether you own a “real” publication or not. It wasn’t that long ago, however, when more premium ad networks worked with premium media, leaving Google’s Adsense to operate among amateurs. It felt like a two-tier ad market. Those days are long gone, since plenty of people were quite happy to pay the cheap rates for the latter. It’s why my loyal Desktop readers who took in my typography column every month between 1996 and 2010 do not see me there any more: we columnists were let go when the business model changed. All of this can exacerbate an already tricky situation, as the worse funded independent media get, the less likely we can afford to offer decent journalism, biasing the playing field in favour of corporate media that have deeper pockets. Google, as we have seen, no longer ranks media on merit, either: since they and Facebook control half of all online advertising revenue, and over 60 per cent in the US, it’s not in their interests to send readers to the most meritorious. It’s in their interests to send readers to the media with the deeper pockets and scalable servers that can handle large amounts of traffic with a lot of Google ads, so they make more money. It’s yet another reason to look at alternatives to Google if you wish to seek out decent independent media and support non-corporate voices. However, even my favoured search engine, Duck Duck Go, doesn’t have a specific news service, though it’s still a start. In our case, if we didn’t have a print edition as well as a web one, then online-only mightn’t be worthwhile sans paywall. Tonight I was interested to see The Guardian Weekly in magazine format, a switch that happened on October 10. It’s a move that I predicted over a decade ago, when I said that magazines should occupy a ‘soft-cover coffee-table book’ niche (which is what the local edition of Lucire aims to do) and traditional newspapers could take the area occupied by the likes of Time and Newsweek. With the improvement in printing presses and the price of lightweight gloss paper it seemed a logical move. Add to changing reader habits—the same ones that drove the death of the broadsheet format in the UK—and the evolution of editorial and graphic design, I couldn’t see it heading any other way. Consequently, I think The Guardian will do rather well. There was an Epson bag hanging from the back of my bedroom door, hidden by larger bags. I opened it up to discover brochures from my visit to a computer fair in 1989 (imaginatively titled Computing ’89), and that the bag must have been untouched for decades. I’ve no reason to keep its contents (if you want it, message me before Thursday, as the recycling comes the morning after), but I wanted to make some scans of the exhibitors’ catalogue for nostalgia. Let’s start with the cover. It’s sponsored by Bits & Bytes. Kiwis over a certain age will remember this as the computer magazine in this country. You can tell this is a product of the 1980s by the typesetting: someone couldn’t be bothered buying the condensed version of ITC Avant Garde Gothic, so they made do with electronically condensing Computers and Communications. In fact, they’re a bit light on condensed fonts, full stop, as they’ve done the same with the lines set in Futura. While the practice is still around, the typeface choices mark this one out as a product of its time. Inside is a fascinating article on the newfangled CD-ROM being a storage medium. Those cuts of Helvetica and Serifa are very 1980s, pre-desktop publishing. It should be noted that Dr Jerry McFaul remained with the USGS, where he had been since 1974, till his retirement. The fashions are interesting here, as is ITC Fenice letting us know that he’s speaking at the Terrace Regency Hotel, a hotel I have no recollection of whatsoever. I can only tell you that it must have been on the Terrace. The other tech speakers have a similar look to the visiting American scientist, all donning suits—something their counterparts in 2018 probably wouldn’t today. In fact, the suit seems to be a thing of the past for a lot of events, and I often feel I’m the oldster when I wear mine. The article itself makes a strong case for CD-ROM storage, being more space-saving and better for the environment: it’s interesting to know that the ‘depletion of the ozone layer’ was a concern then, though 30 years later we have been pretty appalling at doing anything about it. The second article in the catalogue of any note was on PCGlobe, supplied to the magazine on 5¼-inch diskette. Bits & Bytes would have run the catalogue as part of the main magazine, and did a larger run of these inner pages, back in the day when printing was less flexible. It’s a fascinating look back at how far we’ve come (on the tech) and how far we haven’t come (on the environment). Next year, we’ll be talking about 1989 as ‘30 years ago,’ yet we live in an age where we’re arguing over Kylie Jenner’s wealth. Progress? I worry about the control that big corporations have over information. The danger is we get into the situation that existed in the Soviet Union with their papers, Pravda, which means “truth” and Izvestia, which means “news”. The joke was, there was no truth in Pravda and no news in Izvestia. Corporations will always promote stories that reflect well on them and suppress those that don’t. That last bit definitely applies to a lot of the media today, especially those owned outside our country. The rest makes for a great read as Prof Hawking talks about AI, the anti-science movement, Donald Trump, and what humanity needs to do urgently in science. Here’s that link again. 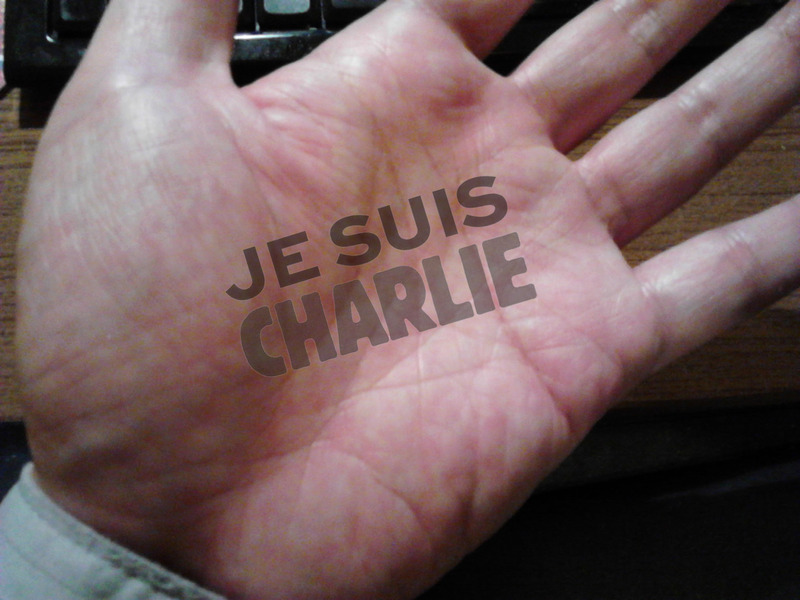 I was watching France 24 about half an hour after the Charlie Hebdo attack and made the above graphic a few hours later, in support of press freedoms and the victims’ families, and showing solidarity with other members of the media. One friend has made it his Facebook profile photo and I followed suit about a day later. Some have, of course, but no more than Christians came out to condemn the actions of Protestants and Catholics groups during the Troubles (although at least the IRA told you to get out of a building), or white American Christians came out against the KKK prior to the Civil Rights Movement. I wonder if there are double standards here. Perhaps this Muslim writer put it best in a Facebook comment: ‘I was just making a larger point about how easy it is to make the assertion and equate “silence” to passive aggression. Most Muslims are from non-English speaking countries. Just because they don’t tweet in support and aren’t given enough media coverage, doesn’t mean they directly/indirectly propagate the oppression conduced by radical Islamists. I’m not denying that those engaged in acts of terror do so in the name of Islam, just as the Klan proclaims itself a Christian organization. They have been able to spread their hate more readily because of where we are in history, namely in an age of easy movement across borders and the internet. But had the same technology been ready 100 years ago, it isn’t hard to imagine Chinese terrorists taking it to the west for what western colonial powers were doing inside China. Would the PLA have been more widespread for the same reasons? Probably. It’s hard for me to have it in for any one faith since we’re not that far away from doing the same, and the fact we aren’t is down to winning the lottery of where, when, and to whom we were born. I definitely have it in for those who are committing atrocities, and they need to be identified and dealt with. We can debate on whether we have a suitable legal framework to do this, and that is another topic. Osama bin Laden’s attacks on the United States, culminating in New York in 2001, were exceptional. Since he could not hope for an American capitulation, the intention must have been to scare the US into a hysterical reaction … [Y]ears of war ensued, years that realised al-Qaida’s wildest dreams. Western nations plunged into battle, at a cost of some $3tn. Thousands of lives were lost and regimes were destabilised across the region. Democratic governments lurched towards authoritarianism. Almost willingly, it seemed, governments tore up many of the central tenets of their liberties. In the more belligerent states – the US and Britain – habeas corpus, private communication, legal process and even freedom of speech were curtailed or jeopardised. The forces of state repression suddenly found themselves singing the best tunes. Terrorism is no ordinary crime. It depends on consequence. It can kill people and damage property. It can impose cost. But it cannot occupy territory or topple governments. Even to instil fear it requires human enhancement, from the media and politicians. That is why the most effective response is to meet terrorism on its own terms. It is to refuse to be terrified. It is not to show fear, not to overreact, not to over-publicise the aftermath. It is to treat each event as a passing accident of horror, and leave the perpetrator devoid of further satisfaction. That is the only way to defeat terrorism. Autocade hit 3,000 models before December 31 was out. The 3,000th: the Renault Espace V.
There are still some big omissions (for instance, all the full-size Japanese sedans, all the Toyota Celicas, and it needs more Corvettes, Ferraris and Maseratis) but a lot of the mainstream model lines are there (all current Geelys, all the Volkswagen Golfs, and more and more current model lines). For a site made primarily out of personal interest, it’s doing reasonably well, with a few thousand page views daily. Currently, it’s on 5,473,963, so the rate is increasing slightly, probably helped by a new Facebook fan page (with a mere 60 members). We have been chatting about some radical changes to Autocade in 2015. Should this happen, I’ll blog about it when I am able. Finally, the resolution to my problems around Linux was putting Linux Mint 17.1 on to a bootable USB stick using Rufus, which happily (and unlike a lot of programs) does what it says on the tin. (The allotted hard drive space for Ubuntu 13, which was determined when I installed 10, became insufficient for 14, hence the Christmas project of trying to upgrade.) Neither Ubuntu 14 nor Mint 17 allowed itself to be installed without hard drive partitioning—it is not poor memory when I say that Ubuntu 10 presented no such hassles in 2011—and that is too risky based on my computing knowledge while I have data on every hard drive that I need to keep. (Again, this is down to experience: an earlier attempt following instructions—that old bugbear—cost all the data on one hard drive and having to Dial a Geek and pay NZ$100.) I could not put either on to the hard drive I wanted, despite selecting the ‘Something else’ option. Putting either into a VM Ware virtual machine made little sense, though I tried it at the suggestion of a good friend, only to find that the only screen resolution that was possible was a tiny 640 by 480. (Going into display settings did nothing: it was the only option available; trying to force different ones through the Terminal also failed, while downloading new drivers for the screen did not make any difference.) After hours—possibly even days wasted if you totalled up those hours—none of the usually helpful forums like Ask Ubuntu had answers that matched my circumstances. The USB set-up is good for me for now, since I do not get that much work done in Linux, but I cannot believe how complicated things had become. As with the browsers I have, there is very little on my computers that is so customized that they would be considered extraordinary—I do not have those computing skills to make changes at that level—so it makes me wonder why there is such a gulf between the claims and the reality when it comes to software, constantly. Yosemite taking 12 hours to upgrade, browsers that stopped displaying text, and now Linux requiring a computing degree to install, aren’t good signs for the computing industry. Unless you are in the support business, then they are wonderful signs for the computing industry. History has already shown us the better way, so why ape an outmoded market leader? A friend had his Gmail hacked, and, much like an Atlantic article I read in the print edition a few months ago, the hackers deleted his entire mailbox. Google says these hacks only happen a few thousand times daily. I’m concerned for him because he has to deal with the Google forums, and we all know how unhelpful and obstructive they can be. I’ve never trusted Gmail, or any web-based email system, “on the cloud”. I’ve always kept POP3 archives and the worst thing that might happen is that some of the older CDs and DVDs might be less reliable. But this event actually brings to mind something else that has concerned me about my method: the email client. I’ve used Eudora since the 1990s. I started with v. 1.2, and for years, my standard client was 4.3. I happily paid for a licence to get the pro version, and used 4.3 till it no longer worked with the settings on our server. That meant I stayed with one email client from 1999 to 2008. I was then forced to upgrade to 7.1, and I have used that since. Qualcomm no longer makes Eudora, and for the last half-decade or so, there have been various “Eudorized” versions of Mozilla Thunderbird. That won’t ﬂy with me, because my demand is actually very simple, but it is going completely unmet: I want an email program that has a vertically tiled inbox and outbox. For the majority of my working life, I have used this method as a to-do list of sorts, and I can see at a glance who I have to deal with. The sad thing is that the three-window interface has become a standard for email programs, but this does not work for me. I don’t want an email program that syncs with calendars or creates automatic Dropbox links. I just want one that works, where I can have ﬁlters and multiple accounts, and where I can have inbox and outbox side by side. This should be, I thought, a relatively simple request, especially as Eudora was, at one point, considerably more popular than it is today. Above: Eudora 7.1, with an inbox on the left and an outbox on the right. Does anyone else make an email program that does this? This is the story of many industries, where inferior norms become the standard. As I typed this, Preston Tucker came to mind: a pioneer who created a safe, fast and aerodynamic car with fuel injection, decades before Detroit could manage the same. But the big players won out and Tucker died a broken man. Americans, and indeed the rest of the world, made do with the same old junk till they were forced to innovate and use ideas that Tucker wanted to mainstream in the 1950s. Similarly, I laugh when people talk about the novelty of hybrids, when you consider how prevalent dual-fuel natural gas–petrol cars were in New Zealand 30 years ago. In the tech world, I happily used—and still use—WordPerfect. Why? It works. And it still works considerably better than its competition. Even a 20-year-old version will blow modern word processors away in terms of sheer functionality and ease of use, assuming you could install it. The latest versions are buggier because of the small user base and the absence of Unicode compatibility. But I persevere with it because, at the end of the day, these programs are tools, and I get my work done far more quickly with WordPerfect. I might be the one person on the planet who does not know how to use Word. I can’t get my head around Word. With WordPerfect, if I set margins and font, it stays that way till I tell it otherwise. Word and its later competitors have a habit of needing styles set, and try to be too clever for their own good. It might tab paragraphs automatically—even when you don’t want it to. It might change margins and fonts on me because it can. And Word’s footnote and endnote creation is still light years behind what WordPerfect could do in 1991. But Word is the standard because Microsoft gave it away in the 1990s. When OpenOfﬁce and Libre Ofﬁce came out, it aped the standard, right down to the crazy way it handled styles. Why? By all means, create versions which would ease the transition, but if you’re to adopt any method, why not start with the best? Word, for years, had WordPerfect transitional settings, to steal customers from the market leader. Before Word became a freebie, friends who I converted to WordPerfect were still thanking me profusely for making their lives easier. It would seem logical for these open-source programs to go with a better underlying technology. I have subbed with Word, and regularly do, because most of our team write using it. By the end of the piece I will have noticed the original writer adopt three styles, because Word has done it that way. My editing will have caused another three or more stylistic changes. It is a mess by the time I save it, with my only solace being that no member of the public ever sees it in that state. When I open a Word ﬁle in WordPerfect, which is what I have to do now with the DOCX format, I see all the superﬂuous code (through Reveal Codes—for Dreamweaver users, it’s not unlike HTML source) and it answers precisely why the program lacks any logic. Styles upon styles upon styles. Even Dreamweaver users who have ever had to deal with a Word-created HTML ﬁle post-Word 2000 know exactly what I mean. Word is an ineﬁcient program, in every respect of the adjective. Above: This is about as simple a document as you can get and the ﬁrst I found with public information: one set only in Courier, 14 pt. WordPerfect shows that Word, on which the document was originally prepared, has still inserted Times New Roman font-change codes on every blank line—for no reason whatsoever. This is one of the reasons I dislike Microsoft Word. Had the document been prepared on WordPerfect, every incidence of the Times New Roman code would not have been present. I don’t know much about programming, but it seems, from every article I have read about these open suites, the new programs are playing the anti-Tucker game, mostly unconsciously, since the developers I have met are usually generous idealists. Let’s stick with this less productive, less logical method of word processing, because that is where the market is. But with fonts and more complex layouts now what people need, I would have thought that the methods employed by old computerized typesetting machines—which used codes similar to WordPerfect—would have been a more logical start for a word processing program. This isn’t an ad for WordPerfect. I simply ask for utility and logic. It doesn’t have to have WordPerfect code. It just needs to be a word processor that does what I tell it to do. Set font, stays in that font. Set margins, stays with those margins. Is this too big an ask? Wouldn’t this save time, which is the whole idea of technology? Why should we become slaves to software, when we created it to be our slave? Email clients, then, I ﬁnd, follow much the same pattern. When I chose Eudora, I have a vague recollection that the New Zealand competitor, Pegasus, was structured in much the same way. The tiled inbox and outbox was a norm, and it worked. People rejoiced. Then, Microsoft decided it would adopt the present three-window standard in Outlook, and it gave away Outlook. I resisted it from the get-go: who wants to click just to see their outbox? Isn’t that an extra step? Why can’t I see my lists of emails at a glance? For someone who gets several hundred messages a day, I need to see more than ten. I would rather see 25 or more. And my outbox would have action items, things I had promised people I would do. So I stuck with Eudora. It’s not about being in Luddite position. It is going back to basics and saying: what would improve people’s workﬂow? Forcing them to click to see something or just showing it? (Twitter UI designers, take note.) Is the three-window convention the best way to use that on-screen real estate? It seems that Thunderbird, the open-source rival, again missed an opportunity by using an inferior convention as its base. By all means, ape Outlook, to ease a transition. But give the public—you are, after all, on the 11th version now—a chance to move the windows as we see ﬁt. Computers are powerful enough now so it must be possible. It was in the 1990s. Let those who love the three-window convention stick with it, but let the rest of us move those windows to our heart’s content, and make life as easy as possible. The aim, therefore, is to gather as much success in the next decade before these programs become obsolete, by which time I should either have (a) hired extra folks to take care of these tasks exclusively or (b) pushed for these features in the open-source programmes. Therefore, making leaps ahead is a good thing, but will people do it? This is always the gamble with predicting future needs: will we go so far that we still miss the boat? We ﬁred but the missile landed in front of her bow. But I’m not even talking about creating something that doesn’t exist yet. I’m talking about existing methods, things that have been around for ages, waiting to be rediscovered. Resizing and detaching windows is a standard feature in so many programs. All it takes is being able to grab this stuff from history—a lesson that could well apply to organization memory as well. History has already told us, when the playing ﬁeld was level, which methods were superior, and what people opted for when confronted with having to spend their own money on software. Before their giveaway periods, the choices were never Word or Outlook. The open-source movement, in my opinion, has a wonderful opportunity ahead of it for creating a new round of ofﬁce efﬁciency. After the chaps at Autocar began following me on Twitter yesterday—after all, I had been reading the magazine since it was part of the Ministry of Magazines, in the post-Iliffe days—I noticed a Tweet about Chevrolet asking its dealers to not refer to the brand as Chevy. A leaked GM memo revealed: “We’d ask that whether you’re talking to a dealer, reviewing dealer advertising, or speaking with friends and family, that you communicate our brand as Chevrolet moving forward. The document was signed by Alan Batey, vice president for Chevrolet sales and service, and Jim Campbell, the GM division’s vice president for marketing. Bad example there, Alan and Jim. Coke is to Chevy as Coca-Cola is to Chevrolet. And no one ever complains of Coke being inconsistent. This is the sort of daft thinking that makes any of us brand professional shudder: total amateurs talking about branding—out of their rear ends. It’s this lack of awareness of what branding is, inter alia, that started GM down its slippery path—with only a brief reprieve when Bob Lutz, aware of what GM’s brands stood for, was around. By demanding that Chevrolet people not refer to the brand as Chevy does the exact opposite to what brand experts and marketers recommend today: to be one with the consumer. I can understand if Chevy was a very negative word, but it isn’t. It’s an endearing word and it does not create inconsistency with the full Chevrolet word. It complements it, connects the brand to the audience, and, perhaps most importantly for GM, builds on the brand’s heritage. After all, Chevrolet itself has encouraged the use of the Chevy name for decades in its own advertising—including during its heyday. Omitting the use of Chevy instantly cuts many Chevrolet connections to its stronger past. And that’s a past that can be used for internal brand-building and loyalty. There was even, formally, a Chevy model in the 1960s—the line that later became the Nova. The Chevy II nameplate even continued in GM in Argentina in the 1970s. The Chevy diminutive is used in many countries where the brand is sold, including South Africa, where it was once as local as braaivleis, rugby and sunny skies. Maybe GM can’t afford the same branding advice it used to—in which case it might be better to shut up than issue memoranda that can be ridiculed so easily. Or get Bob Lutz back again. One month after retirement, and the natives have lost direction again, Bob.